Our video explores graphic facts of homelessness and the options for concerned citizens to explore. NPR reports that the number of homeless in the US declined in 2013, however these statistics are often difficult to track from the transient and elusive nature of the populations under study. 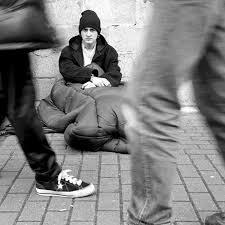 Their report indicates that in 2013, around 610,000 people were homeless on the night under study. Homeless numbers are many times inaccurate as youth and others who are homeless often avoid shelters, couch-surf, commit crimes, or visit ER’s and other “non-shelter” institutions to obtain housing. It is generally understood that at least half of the homeless population in the US are under the age of 21, which would indicate on this night that at least 305,000 young people were without stable housing in the US: equivalent to roughly half of the state of Vermont. So, do any solutions exist for the homeless youth populations? With the prevalence of smartphone use in America today, the U.S. Department of Veteran’s Affairs has launched a contest for app developers to assist in aiding homeless veterans. Project REACH (Real-Time Electronic Access for Caregivers and the Homeless) requested app developers to put all the vital information for homeless individuals in one easily accessible and rapidly available place. Food, shelter, transportation, legal services, healthcare, and employment is all available in one easy location for friends, family, and citizens to aid individuals who currently are or are becoming homeless. The implications and consequences of this technology presents obvious benefits and several pitfalls to consider. The winning app, Qbase, is currently available on iTunes and Google Play and can also be accessed online to add resources nationwide. On one hand, this information is extremely useful for friends and family of individuals in need of services. Secondly, even runaway and homeless youth often maintain smartphone service as this has become a vital part of youth culture and maintains connectedness with peers. It seems a huge leap in the right direction and is somewhat inspiring to see innovative tactics being used to assist the homeless populations with the assistance of widespread technology. Also, it maintains the entrepreneurial spirit and leverage social capital as a safety net. Alternatively, would and should ordinary, untrained citizens participate or even attempt to assist homeless individuals.? Are there hazards to consider and should any trainings, instructions, or disclaimers be offered alongside these emerging technologies. There has been recent controversies over the trend of homeless “selfies” being taken with homeless individuals, but would people be willing to then use that smartphone to connect the homeless with needed services? Secondly, the dilemma of the homeless LGBT community is slowly being recognized within Congress as they have introduced a new bill to address this disproportionately affected community. The Runaway and Homeless Youth Inclusion Act would provide discrimination protections for LGBT youth in federally sponsored shelters as well as require cultural competency training for shelter workers. While a step in the right direction, is this adequate? Are there other avenues to prevent, remediate, or alleviate the compounded problems for homeless LGBT youth? Are there community-based solutions under- or completely unutilized for these populations? Sean Haggerty is a graduate student from the University of Southern California, concentrating in Community Organizing, Administration, and Planning. With volunteer experience, both home and abroad, Sean works most passionately with disaster relief, poverty, and environmental sustainability, leading and joining various efforts to decrease the impact of each. Sean also maintains several years experience in youth development and providing in-home services to families experiencing the impacts of poverty, discrimination, and mental health issues. As an ISC intern, Sean looks forward to focusing on the call for diversity in the environmental movement, volunteerism and social capital as they relate to poverty alleviation, and disaster relief.